You can have the best of both worlds. 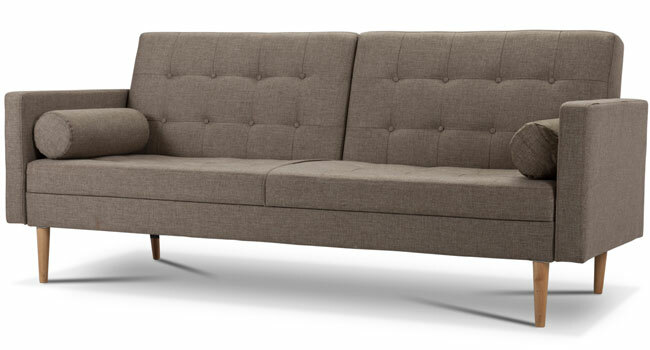 Sofa beds offer the benefits of seating and sleeping, but they don’t have to look ugly. 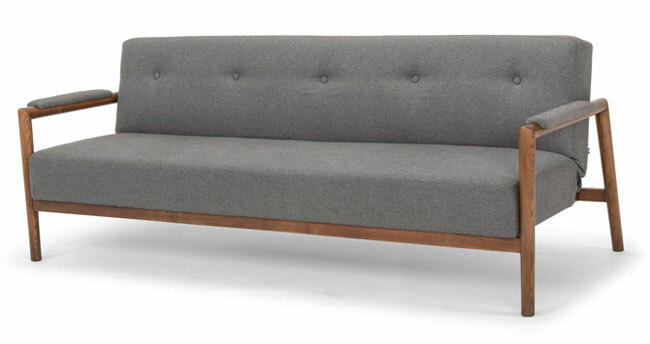 Here are 10 midcentury sofa beds with plenty of style. A limited edition in a couple of colour options and a design a step away from the norm. A really stylish minimalist look that puts us in mind of vintage Scandinavian pieces, a retro oak frame with tapered legs and a couple of ‘clicks’ away from being a bed. £899 gets you one of these. More Scandi style and another limited edition. In fact, we only featured this one earlier this month and it proved rather popular. A vintage look with that dark stained oak frame and button detailing and a piece that doesn’t look like a sofa bed at all. But when friends drop by, you’ll be glad it is. £849 is the price. A fairly standard midcentury design, but well worth mentioning. That’s because this one comes in a range of colours and has price on its side. 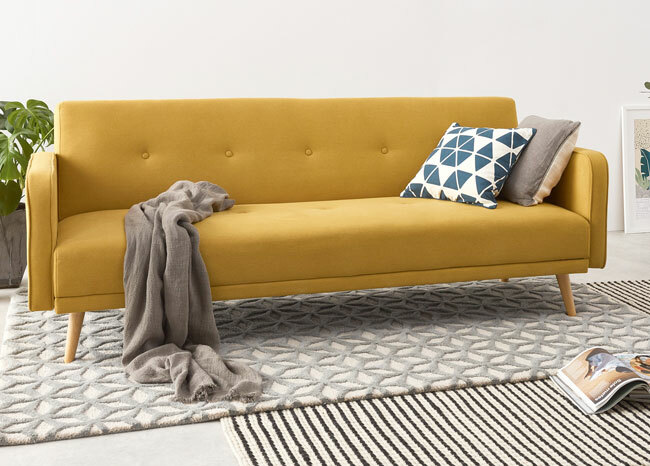 We do love this ‘butter yellow’ colour option, the button detailing and the tapered legs. If you don’t like yellow, do see the site for the other options. £299 is the price. 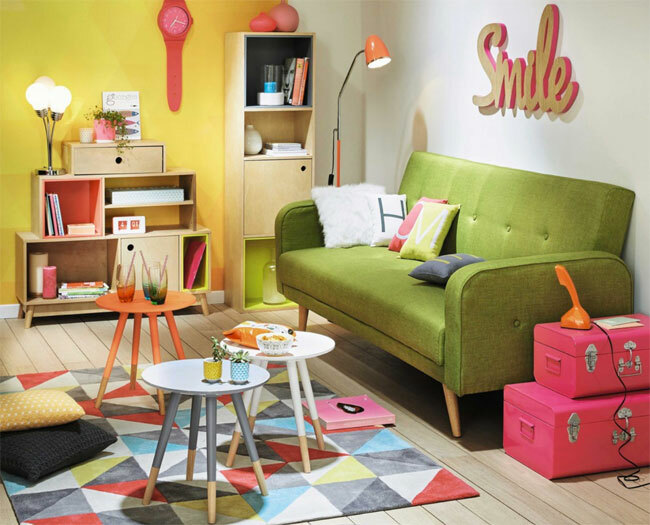 There are a few different pieces from Innovation at John Lewis, none of them cheap, but all of them rather lovely. This is actually one of the more affordable. 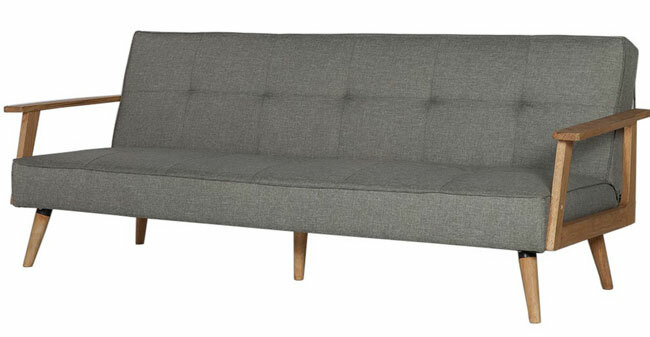 Made in Denmark, this midcentury pocket sprung sofa bed has a simple pull out base and drop down back for the bed, but looks rather hip as a sofa too, not least with the dark elm wood legs. £899 for this. 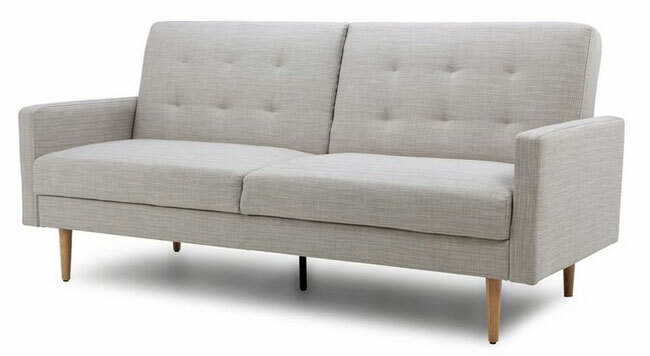 Amazingly, this Hygena Margot sofa bed is available at Argos. Although you might want to order it online, I’m not sure it will fit into the boot of your car. 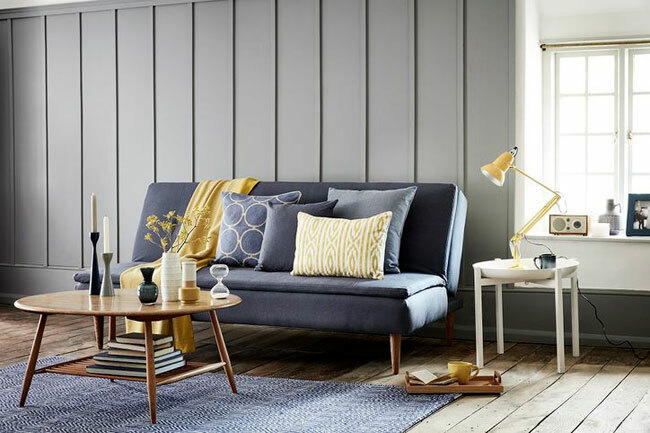 More midcentury Scandi inspiration at work here, with a nice wood frame and tapered legs and a design that operates as a two-seater sofa or a small double bed. £299.99 is the price of this one. 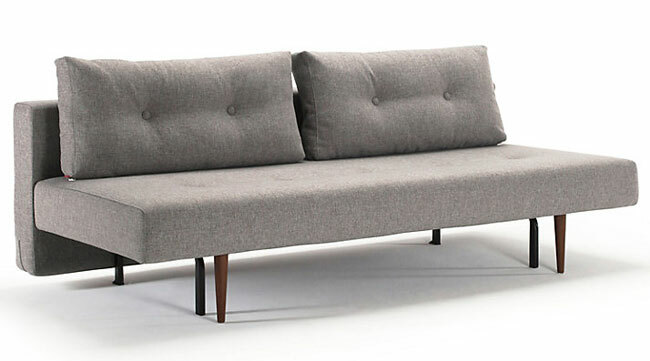 Now this is probably what you think midcentury sofa beds should look like. But with a little more style. The addition of a topper means more comfort and the absence of arms means a person of any height can now stretch out and drift off to sleep. Ok, you might not look as much like a sofa than some others on here, but those tapered legs add some style to the mix and this would definitely suit a midcentury setting. Priced from £710. Yes, the store with the never-ending sale has something in the midcentury modern line. It’s called the Lola. A 1960-inspired design that’s only available in this silver fabric, but does make up for it in looks, with the angular shape, button detail and (of course) four tapered legs. £499 is the price and yes, that is the sale price. A second appearance from Swoon in the rundown and the return of that oh-so-hip Scandinavian shape. The Darcy is available in three shades, all with the angled oak frame, matching trim on the arms to the main body, button detailing and easy conversion to a bed. A limited run of 9 and each selling for £1,199. We once mentioned a company called Modern a lot, but they seem to be no more, their website redirecting to Dunelm. I suspect they have been taken over and as a result, there are more MCM designs at Dunelm right now. This is our favourite. 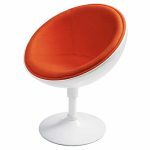 Channelling Florence Knoll, it’s a ‘boxy’ design with the usual button detailing and tapered legs, along with a solid foam and sprung base to aid in a night’s sleep. £350 if this catches your eye. Rather like the Made bed, but with subtle differences and alternative colour options. It’s a design we rather like and although not breaking the mould for this kind of item, this is still an eye-catching and affordable option, especially if you need a sofa more than a bed. This really doesn’t look like it flips down. But it does. £314 for this one.